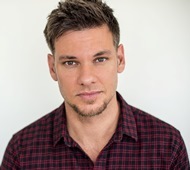 Theo Von (BGS 2011), one of most sought after touring acts in the country, was named Interdiscipinary Science distinguished alumnus in 2015. Theo taped his own Netflix Special in New Orleans this fall. He was the host of TBS’s hidden camera show DEAL WITH IT from Howie Mandel as well as the longtime host of Yahoo!’s popular daily recap show PRIMETIME IN NO TIME, one of the most-watched shows on the web with nearly one million views per day. As a standup, Theo had the highest rated half hour special on Comedy Central in all of 2012. His website CrankTexts.com has had over 10 million page views and averages 18 clicks per visit. Theo was voted “Fan Favorite” as a semi-finalist on LAST COMIC STANDING.